2 oz. 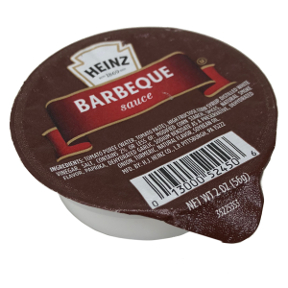 Barbeque sauce cup. Portable barbeque sauce for lunches, travel, RVing. Ingredients: Distilled White Vinegar, Pepper Sauce (Peppers, Vinegar, Salt, Xanthan Gum and Benzoate of Soda [to reserve Freshness]), water, Salt, Modified Food Starch, Spice, Soybean Oil, Xanthan Gum, Potassium Sorbate (Preservative), Extractives of Paprika, Soy Lecithin, Carmel Color, Calcium Disodium EDTA (Added to Preserve Flavor).